Based on fossil finds the size of a thumbnail, paleontologist Chris Beard (PhD '90) has developed some bold ideas that challenge the conventional wisdom about how--and where--primates evolved. "The crust of the earth is a vast museum; but the natural collections have been imperfectly made, and only at long intervals of time." In the mid-1950s, workers carved out a few acres of the pine forest blanketing Meridian, Mississippi, and built a large truck stop called the Red Hot. The Interstate followed shortly, and soon a regular stream of truckers from Atlanta, Birmingham, and Baton Rouge were sitting down on the restaurant's red vinyl stools to load up on coffee, hamburger steaks, grits, and biscuits smothered in sawmill gravy. Locals came too, and the truck stop's friendly sign--a crimson "RED HOT" welded onto a turquoise backdrop--became a landmark in this corner of southeastern Mississippi. Today, the rusting sign is all that remains of the original Red Hot. In 1999, developers demolished the truck stop to make way for a 203,750-square-foot Wal Mart Super Center and several other big box retail stores due to open this summer. Held aloft by scaffolding and a crumbling section of brick wall, the sign looks out like some dinosaur over a sprawling bog of fast food franchises and auto dealerships. Artwork by K. Reed As it happens, the Red Hot name still lives. When the truck stop began serving its first hamburger steaks, amateur fossil hunters started finding fossil shark's teeth in the woods beyond the Red Hot's parking lot. Decades later, paleontologists came and unearthed fossils dating from the late Paleocene and early Eocene, or roughly 55.5 million years ago, a slice of the paleontologic timescale not available elsewhere in the southeastern United States. A prelude to our own Cenozoic era, it ushered into North America many modern-day species, and mounting evidence now indicates that it was also a time of dramatic global warming. Over the years, paleontologists continued to probe the dirt beyond the Red Hot, for which they were richly rewarded. They named their cache the Red Hot local fauna. Now, construction on the Wal Mart proceeds apace, rolling asphalt and concrete ever closer to the fossil-rich earth. It is November 2000. Paleontologist Christopher Beard (PhD '90) and three of his colleagues park a dusty Chevy Suburban in what remains of the Red Hot's parking lot. They unload shovels and picks, and begin what could be the last major fossil hunt at the site. The team has driven from Pittsburgh, where the 39-year-old Beard is associate curator at the Carnegie Museum of Natural History, a position equivalent to tenured professor. Beard was one of the first paleontologists to realize the bounty that lay beyond the truck stop. Now and over the next week, he and his colleagues will conduct their dig at the wooded hill behind the spot where the Red Hot once stood while, nearby, construction workers lay beams and pour cement. Beard's colleagues have called him one of the rising young stars in vertebrate paleontology, and last year he received a MacArthur Foundation "genius" award, worth $500,000. Based on finds he has made over the past decade in China and here in the United States, Beard has developed some bold ideas that challenge the conventional wisdom about how, and where, lower primates (such as lemurs and tarsiers) evolved into higher primates (the group that includes monkeys, apes, and people). He is now propounding another provocative theory. Beard contends that most of the new species that began appearing in Mississippi and elsewhere in North America at the dawn of the Eocene came from Asia. What drove the massive migration, he believes, was global warming, and thus he argues that his current work could help us foresee the effects of today's warming trend should it continue unabated. Curious to see how digging up fossils leads to the unofficial title of genius, I asked Beard if I might accompany his team for a few days. He obligingly agreed. Now, early one afternoon in November, I park next to the Red Hot sign and walk over the red Mississippi dirt. Beard, who has made several fossil-hunting trips to the Red Hot over the past 10 years, first learned about the impending construction of the Wal Mart Super Center last year when a newspaper reporter called him for a quote. 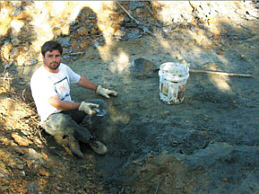 He immediately applied to the National Science Foundation for emergency funding, which he received, to salvage a variety of plant and animal fossils at the site. With the help of local schoolteachers and local scientists, he also negotiated with developers to preserve, at least for now, a portion of the fossil-bearing land so that he could sift through it. Though the developers were sticking to their promise, the future of any still-buried Red Hot fauna is uncertain. When I first glimpse the site--a copse of spindly pine, oak, box elder, and sweet gum surrounded by acres of flattened red earth-- it looks vulnerable. Beard emerges from these woods and waves hello. He has a broad face, jet black hair, and a wrestler's build. Even though it is unseasonably cool, he has stripped to his shirtsleeves, revealing ditch-digger biceps. "My style of research and my whole research agenda is based on a lot of field work," Beard says by way of introduction. He is friendly, earnest, and immediately likable, with the gentle speaking manner of a natural teacher. He leads the way down a short dirt path through brambles and tall grass that have become a catch basin for highway litter: discarded tires, partially shredded trash bags, a portion of a staircase. The path leads to a ravine cut by a narrow stream. Across the water, a steep 12-foot dirt wall towers over a muddy bank. The fossil beds are at the top of this cliff. The researchers have jury-rigged a rappelling line by knotting together two garden hoses and tying it to a tree on top of the cliff. Beard grabs hold and easily hoists himself up. I follow, not as gracefully. At the top, a seven-foot-high pile of rock rubble sits next to a scoured semi-circle of earth. Jurassic Park it isn't. A good find here is a two-millimeter-wide mammal tooth. But that's enough to fill in a gap in the record. In paleontology, big ideas often come in little packages. Expert anatomists like Beard, who in one glance can tell a rabbit's tooth from a rat's from a cat's, can render an entire animal (at least a hypothesis of the way one looked) from a bone the size of a toenail. "With any luck," says Beard, "what I'd like to do at this stage is have one major go at learning everything we can about life that inhabited this area 55 million years ago," the end of the Paleocene and beginning of the Eocene. The period is particularly important to understand, he explains, because "you're going from an ecosystem with very archaic elements, with no descendants in the modern world, to one where you can identify animals, such as bats and primates, that exist today." This trip, Beard is particularly excited about fleshing out the details of how plants fit into this ecological mix. His team includes Peter Wilf, a paleo-botanist from the University of Michigan who is conducting some of the first studies on Red Hot flora. Since they began digging at the Red Hot site in Meridian, Mississippi, in 1990, Beard and his colleagues, including the Carnegie's Yvonne Wilson (pictured below), have collected some 200 fossil specimens. It's backbreaking and tedious labor. By Joanne Cavanaugh Simpson Beard picks up a shovel and plunges it into a ledge of blue-green sandy earth in the scrubbed-out semicircle. "That's this level here," he says, tapping it with the blade. "The Paleocene/Eocene boundary has been relatively well sampled in the fossil record from Wyoming, Paris, Belgium, South England, Portugal. Now we're filling in what happened in the southeastern U.S."
During this long ago period, which began about 10 million years after the last dinosaurs died out, the planet experienced a dramatic time of global warming, Beard explains. According to one theory, this ancient climate change stemmed from the melting of methane hydrate ice buried in sediment columns on the continental shelves. "The methane bubbled up to the atmosphere as a greenhouse gas," says Beard. "Some people call it the great fart. It warmed things up like crazy." This "great fart," which lasted about 10,000 years, pumped about as much carbon into the atmosphere as humans have added since the Industrial Revolution, a point Beard underscored in his request to the NSF for emergency funding. "There were crocodiles in Canada and palm trees in southeastern Alaska," says Beard. "The climate [eventually] went back to equilibrium. But in the meantime, the massive warming allowed all these animals to move around, which had an irreversible effect on evolution," Beard notes. In North America, many types of animals became extinct because they could not compete with the new varieties. "If the question is, what happens to the ecosystem as a result of global warming, then what happened during the late Paleocene and early Eocene is a natural experiment." The sound of a passing truck drowns out his words for a moment. He waits, then sums up. "The grand metaphysical questions of life: Who are we? How did we get here? Those are fundamental questions all thinking people have considered. Paleontology is one way to address those scientifically." Beard got his start in paleontology after several prominent scientists had already made headline-grabbing discoveries of fossils marking the transition from ape to human. There had been the spectacular finds of the Leakeys--Louis and Mary Leakey and later their son Richard. Don Johanson in 1974 had found 3-million-year-old "Lucy," the most complete skeleton of the primitive hominid Australopithecus afarensis. A team that included Alan Walker, a former Hopkins paleoanthropologist now based at Penn State, had attracted considerable attention for the discovery in the mid-1980s of a nearly intact skeleton of Homo erectus in Kenya. As a graduate student at Hopkins in functional anatomy and evolution, Beard participated in some field studies in Africa, as well as a slew of other research projects. In conducting such work, he exhibited a sharp mind and acute ability to spot fossils that impressed his teachers. He was also extremely prolific; former faculty advisor Kenneth Rose, Hopkins professor of cell biology and anatomy, recalls Beard's manuscripts piling up faster than he could read them. Beard was not interested in following the well-trodden path of investigation already laid out by eminent researchers like the Leakeys or Walker. "The fossil record is already good enough that we know how humans evolved from apes," he remarks during a water break that afternoon. Hominids split from the line of apes and chimps 5 to 10 million years ago in Africa (although exactly where is still a matter of debate). Beard's finds have led him to revise the evolutionary tree, adding a spot for the diminutive Eosimias, or proto-monkey. By contrast, paleontologists know relatively little about the transitional species that arose between the lower primates such as the nocturnal, tree-dwelling lorises, lemurs, and tarsiers, and higher primates such as monkeys, apes, and Homo sapiens. "There is a huge void in the fossil record," says Beard, setting down his drink and picking up a shovel. He started exploring this gap as a graduate student, and continued when he went to the Carnegie in 1990. Since the transition from ape to human took place in Africa, many paleontologists had assumed that the preceding evolutionary steps unfolded there as well. But soon after he began work at the Carnegie, Beard began to follow leads that pointed to a different continent entirely: Asia. In 1992, while digging in middle Eocene soil deposits in Jiangsu Province, near China's east coast, Beard and his colleagues unearthed several distinctive fossils, including a portion of a tiny lower jaw containing parts of three molars. Judging from their anatomy, they appeared to be Eocene primates. However they looked unlike any primitive primates he had seen before. Beard and his colleagues concluded that they came from a previously unrecognized species of higher primate. They named it Eosimias sinensis, "dawn monkey." Based on these first and later fossils, and with the help of a Carnegie artist, the researchers have constructed a drawing of what Eosimias might have looked like. The mouse-size creature they envision could have fit in the palm of a person's hand. It has a short muzzle, sharp teeth, a long tail, and a fondness for high-calorie foods such as caterpillars to fuel its active metabolism. Beard was convinced the fossils had come from a higher primate. For one thing, Eosimias, like monkeys, apes, and humans, appeared to have a deep chin, while lower primates have more abbreviated chins. Moreover, he and his colleagues found striking differences in tooth structure between what were apparently male and female animals. Such sexual dimorphism in teeth is common in monkeys and apes (male baboons have enormous canines, for example, while females do not) but not in lower primates. If Beard was right, his findings would overturn long-held scientific convictions. Paleontologists had long assumed that because apes are large creatures, their evolutionary predecessors would have been large as well--not the size of diminutive Eosimias. Moreover, Beard asserted, Eosimias, along with certain fossils he had found in other locales, suggested Asia as the origin of higher primates. "Everything we thought we knew about how monkeys evolved [appeared to be wrong,]" he says. Beard debuted Eosimias in 1992 at Duke University during a conference on anthropoid origins. His colleagues were not sold. 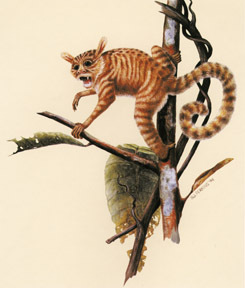 While some acknowledged Eosimias to be a primate, they believed it belonged in the prosimian, or lower primate, lineage. Others said the findings were utter malarkey, that Eosimias was not a primate at all. One scientist wagered that the "monkey" was a hedgehog. Even Kenneth Rose, Beard's former Hopkins mentor, took issue with Beard's interpretation, telling his former pupil, "Chris, I just wish you would tell me what makes that an anthropoid." "I was fairly confident it was a proto-monkey," Beard continues. But he knew he needed more evidence. So he returned to China, and continued digging, again in Jiangsu and in sites in central China's Shanxi Province, along the Yellow River. The turning point came on a day in late May 1995 when Beard and his colleagues were digging in a gulley near the Yellow River. After lunchtime a manual laborer named Lao Wen who was working for the team drove his rock pick into a boulder, splitting it neatly into two halves like a nut. "Ya cuan!" he shouted. "Ya cuan!" Everyone ran to see. Each half of the rock contained a tiny half of a jaw, or ya cuan. Every tooth in place. It looked like Eosimias, but was different enough that the scientists concluded it belonged to a second species, which they named Eosimias centennicus. "It was an incredibly beautiful specimen," Beard recalls. Since the fossils were intact, they were much more reliable than the ones Beard's team had discovered earlier. They supported the image Beard had developed from those less complete fossils. More recently, Beard added to his Eosimias collection several ankle bones from the same sites in China. Some are as small as a grain of rice. Interestingly enough, says Beard, the fossils "show an incredible combination of monkeylike and prosimian features." The calcaneus, or heel bone, for example, is rather short, which helps a monkey walk around on all fours (in contrast, prosimians such as lemurs and tarsiers, which do a lot of leaping, have extremely long heel bones). But other aspects of the feet bones looked more prosimian. In essence, "they are a chimera," says Beard, who reported on the fossil bones in the March 2000 Nature. To Beard, this is significant, further evidence that Eosimias is a "missing link" between lower and higher primates. Many vertebrate paleontologists are now starting to see things his way. But some holdouts argue that Eosimias's prosimian features should relegate it to the lower primate branch of the family tree. The debate does not seem to perturb Beard. "Eosimias is the oldest and most primitive higher order primate," he says calmly. "In my opinion, Eosimias is already well on its way to becoming a monkey." Primates eventually moved on to Africa, where the later stages of evolution--the transition from ape to human--transpired, says Beard. But they originated in Asia. Beard has recently taken his Asia focus a step further. He now asserts that a large number of mammals that originated in Asia spanned out to other continents during the Paleocene/ Eocene boundary. While not the first paleontologist to ponder Asian beginnings, Beard says he is taking this theory further than anyone else. In a recent paper published in the Bulletin of Carnegie Museum of Natural History, he said North America had been a "biogeographical cul-de-sac of Asia," wording he chose, says Beard, to be provocative and test the bounds of the model. Comparing the fossil record from Mississippi to that from other locales (Wyoming, Asia, Belgium) suggests that mammals at the Paleocene/Eocene boundary migrated from Asia to North America over the Bering Land Bridge, and then marched onward over a North Atlantic land bridge to Europe, says Beard. His interpretation has met with some resistance. Beard's colleague and friend, French paleontologist Marc Godinot, believes that many of the mammals during this time, particularly the hoofed varieties and primates, proceeded from Asia to Europe and then to North America. The debate continues. While on a dig near China's Yellow River, Beard and his team unearthed a tiny half jaw, teeth in place. 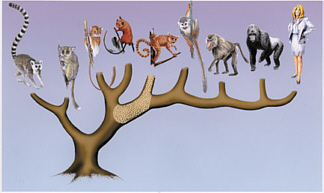 They named their tiny proto-monkey (reconstructed above by artist Nancy Perkins) Eosimias centennicus. Meridian is a city of about 42,000 people just west of the Alabama border. The city hit its boom times around 1900, when it was the junction of five railroad lines. A few elegant older buildings and a handful of antebellum mansions in central Meridian attest to those finer days. But many are now empty shells; greater Meridian has spread beyond its previous boundaries in an ever-widening circle of malls, suburbs, and highways. The city is 150 miles north of the Gulf of Mexico. But in the distant geologic past, when sea levels rose, the ocean lapped at the southern boundary of this place, and an estuary flowed over its surface. Later, in its retreat, the sea deposited sundry mementos--a bone here, a tooth there--of the sharks and rays and fish that swam in those ancient waters. The fossil hunters who first explored the rocks and hills behind the Red Hot parking lot discovered an abundance of these riches, particularly sharks' teeth. News of this cache attracted an amateur paleontologist from New Jersey named Gerard Case. An avid collector of fossil sharks' teeth, Case visited the site in the 1970s, finding many Cenozoic shark fossils. He also discovered what appeared to be a jaw and other fossils of a mammal. These he donated to Princeton, which gave them to Yale, where they remained in relative obscurity for many years. 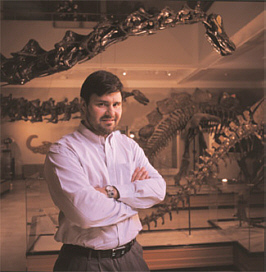 In the late 1980s, while on a visit to Yale to do research for his doctoral dissertation, Beard opened a drawer labeled "Mississippi Eocene Mammals." He knew immediately he had struck gold. Paleontologists had not until then documented early Eocene mammals from that part of North America. He borrowed the fossils, and kept them when he moved to the Carnegie, finally making his first field trip to Meridian in 1990. Since then, Beard and his teammates have collected some 200 fossil specimens of Red Hot fauna. On this chilly November afternoon, Beard and his colleagues continue shoveling, hauling, and sifting dirt. It's backbreaking and tedious labor. Until they cart their take in black trash bags back to the lab in Pittsburgh and examine it, a teaspoon at a time, under the microscope, they can't be sure what fossiles they have found. Kneeling beside Beard is Howard Hutchison, a quiet, white-bearded paleontologist and fossil reptile expert affiliated with the University of California. Today he scoops up the dirt and deposits it in a five-gallon bucket, continuing until his pail is full to the brim. Then he hauls it to the edge of the cliff, ties the end of a rope to its handle, and slowly lowers it down the slope. At the riverbank below, Ilona Weyers reaches overhead and grabs the bucket. Weyers, who worked in public relations in her native Germany, fell into paleontology after signing on as a collection assistant and office manager at the Carnegie, jobs that led to invitations to serve as an extra pair of hands in field studies. An enthusiastic and witty field hand, she has learned important tips of the trade, such as the one she offers me: "If water is not around, you're told to put the fossil in your mouth to clean it off. If something is soft, don't ask. Just spit." Weyers sets down the bucket next to Yvonne Wilson, who works as a museum guide and fossil preparator at the Carnegie, which means she spends much of her time cleaning and piecing together miniature fossils while peering through a microscope. "It's art and science all combined," she remarks. Wilson dumps the bucket's sloppy contents into a sieve. The simple contraption is a fine-mesh screen nailed to a wooden frame. 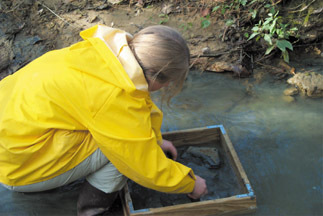 Straddling the creek, Wilson, who is wearing rubber boots and a yellow raincoat over a sweatshirt and jeans, sets down the screen in the shallow creek and sifts the mixture, occasionally stopping to break up the large clumps of mud with her fingers-- slowly so as not to damage any fossils they might contain. After several minutes of this, she pulls the screen out of the water. What was five gallons of dirt and mud has now been reduced to a cupful of pebbles. Craddling the sieve, Weyers climbs the slope to the old parking lot and overturns the box onto a blue plastic tarp to let the contents dry in the sun. Half the tarp is already covered by these gleanings, which, to the untrained eye, look like ordinary gravel. But one never knows where there is a treasure. Alan Tabrum, a wiry, bespectacled Carnegie scientist, wanders over and squats to survey the tarp. Almost immediately he spots something. "Here's a shark's tooth," he says, transferring a cigarette from one hand to the other so he can pick up the eraser-sized fossil. Its pointy end still suggests the pain such a creature could inflict. I peer more closely at the tarp and soon have identified three other shark's teeth. The team will be lucky if it finds one mammal tooth for every one from a shark, says Tabrum. The span of human existence is so small compared to what has come before-- when returned to ashes and dust, we will mark but a sliver in the strata. On my last afternoon in town, I leave the researchers to their digging for a while and drive north. After a few miles, the malls and stores disappear. The highway rolls through high walls of thick pine forest and iron-red hills. Houses become more modest, yards become larger. I am not exactly sure what I am looking for. I am just indulging a vague yearning to get away from the concrete and asphalt. Then, at an intersection well off the beaten path, I think I find what I am seeking. It is a simple white clapboard building. A sign above its wide front porch announces the Causeyville General Store. On this porch, two scraggly old hounds nap and a pair of wooden rockers sits idle. The store is run down just enough to look authentic. In front of the store is a rusty red gas pump with rounded corners, shaded by the limbs of a 100-year-old tree. It is a scene straight out of a postcard. Then, one of the dogs awakens, arthritically pushes himself up, issues a feeble "woof," and walks out of the postcard. The spell is broken. On the drive back to Meridian, I ponder how fleeting our sojourn on this planet is. The decades pile up. Big shops replace smaller ones. Civilizations grow and crumble. Yet the span of human existence is so small compared to what has come before. The entire history of our species, when returned to ashes and dust, will mark but a sliver in the strata. A line of Shakespeare keeps buzzing through my brain: "It is a tale told by an idiot, full of sound and fury, signifying nothing." Then I recall something Beard told me earlier when I raised these brooding visions. To him, paleontology does not conjure up the existential abyss; instead, it allows some humbling lessons. "For a long time," he said, "since Darwin or before, people have had the idea that if we can understand our evolutionary origins it will give insight into how we fit into the grand scheme of things." But the story of evolution, said Beard, "is not a mythic tale of humans rising up and taking over." Rather it reveals our interconnectedness. "We are just one of 200 higher primate species. Yet many of those species are endangered or threatened." Humans, he noted, have existed for just one-tenth of the time that tarsiers have. "If they go down, you're sawing off a twig that's perilously close to our own. They have been around for 55 million years, relatively unchanged. They weathered the ice age. Can they survive deforestation? I don't know. "To me, the great power of understanding our deep history is that it puts us on an egalitarian footing with life forms on this planet. Is the world really going to be a better place if we transform it to be just us and our brethren?" It's getting toward evening when I arrive back at the field site. The fading light is too dim to tell a fossil tooth from a pebble. The Red Hot sign casts a long shadow over the crumbling asphalt. I park near the road, and watch as the researchers load their shovels and picks into the truck, fold up a tarp, pile into the truck, and drive away, rumbling over the rocky ground. The weathered sign's shadows grow longer and finally melt into the darkness, as the sun sets over the Red Hot. Formerly the magazine's senior science writer, Melissa Hendricks now writes from Annapolis, Maryland. She extends her thanks to David Dockery, of the Office of Geology at the Mississippi Department of Envrionmental Quality, for sharing his expertise.